You know there are so many cool swimsuits to choose from for mothers these day. I am not talking about the regular ones that make you stuff out and tight. Maternity swimwear to fit your lifestyle and personal choice. They come in many colors and are very sizable. Made for people who got bellies and stuff you didn’t think you would get when you first got pregnant. The best swimsuit for pregnancy is now here for all pregnant women to enjoy. No more going to the beach and having a look that is just awful. Now, you can throw away that t-shirt and try a one piece pregnant swimsuit. Considering this,view below for more on the maternity swimsuit. There things and elements you should look for before you buy a maternity swimsuit. Look for one that has adjustable straps. The adjustable part is for you and your baby. You know what I mean. The size of your belly might enlarge more than you predict. So, get a swimsuit that can stretch and has straps that are very adjustable. It feels little weird at first because your use to tight stuff but you get use to it. Next, make sure the fabric is durable. Ask the people you buy it from or look at some reviews. Check to see how long the swimsuit lasts. I don’t know your situation, but you probably don’;t want to buy a new swimsuit each year. Once that is settled, look to see if the suit is chlorine resistant. You might go to the beach or the back pool. Be prepared to do both because why not. The color you choose you always be a color you really want to wear. Most women will tell you to wear a swimsuit in black, but wearing a dark blue one is just as cute. Equally, wear what makes you happy. Its your money and your body. Teat the purchase like it is. If you happen to want to wear a pink swimsuit then wear a pink swimsuit. Do not get pressured to wear a color you don’t like. You are not in high school anymore. People need to like you or move out the way. Your too old for that you know. The right one is the one that is reliable and feels right. The best swimsuit for pregnancy you choose to wear for the next beach trip is only acceptable if you say. Feel it is the right one overall and it will be the right one. Make sure it is reliable for the baby, but colorful for your own personal taste. People have opinions and what not to wear stuff. But, you should where what you feel you should and wear wheat it reliable to be safe. That is really all you need to know. This entry was posted in BLOG, CLOTHING, Life on April 3, 2019 by makesmomhappy. I am so excited to share this awesome line of clothing with you, Happy Moms! I discovered Shade while I was searching the interweb for clothes. Clothes that wouldn’t have me mistaken for my daughter’s babysitter. Clothes that are tasteful and modest, yet still hip, young, and fresh. I found ’em! And they’re at Shade. Shannon at Shade was kind enough to send me an outfit to test-drive – more on that next week, though (so check back!). I fell in love instantly. Everything fit, it looked great. I was thrilled! Something had me even more pumped about Shade, though. It’s their The Bright Side campaign. After seeing the economic downturn affect people she knew, CEO Chelsea Rippy decided to do something at Shade to give back. 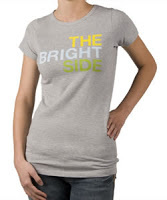 And so The Bright Side tee’s were born. These shirts are very cute and wearable fitted tee’s that you’ll really want to wear, go have a look! You’ll love wearing these shirts and you can feel great about buying them, because – get this! – FIFTY percent of the net sales of these shirts goes to the United Way. Fifty percent! How awesome is that?! I’ve been wearing this one all the time since it arrived, I love it! I especially love that it’s long enough to kind of pile up at the bottom for a faux–rouching effect, which is fabulous for hiding my post-baby tummy. Everyone asks,”What’s The Bright Side?” and I get to tell them all about it, which I love. Buy a cute tee and give back? Count me in! I hope you’ll go there and do the same. This entry was posted in CLOTHING, GIVE BACK, GIVEAWAY on May 21, 2009 by makesmomhappy. Laundry with No Soap?! It’s a Mystic Wonder! See that? It’s the Mystic Wonders Complete Laundry System, sitting in front of all the laundry products I used to use. You’ve gotta hear about this! I do a ridiculous amount of laundry. And since I’m one to let it pile up, it’s that much more burdensome when I do finally get around to it. And usually, there’s a load of clothes from the last time I did laundry waiting for me in the dryer, half picked through from taking things we needed out all week. Of course, this time was no different, so I figured I’d toss my new dryer balls in to fluff everything up. Not much of a test, but I figured I’d break ’em in easy. They worked like a charm, everything came out like….well, like it hadn’t been sitting in the dryer for a week! Next, I tossed the really cool Wonder Ball in the washer with a load of towels. My first reaction: Does thing work? Could it possibly? It doesn’t require detergent! Nothing but water. Water + Wonder Ball = clean laundry? You bet! I’ll admit, it took some getting past the idea of not pouring soap into the little dispenser drawer, but I went ahead. From the Mystic Wonders site: “The Wonder Ball works through physics. The frequency enhanced mineral blend within the ball creates an energy field when agitated in the machine. When this energy meets with the water, the water is in its best cleaning state. It is the water that does the cleaning.” I set the washer to hot (always the setting I use for towels) and let it go to work. I threw the wet towels into the dryer with the two Wonder Dryer Balls when they were done. No dryer sheet, zip, zilch, nada. These showed immediate results – it took ten minutes off the dryer cycle, which is great. I will say that the towels had some static cling going on when I took them out, which really drives me bonkers. So, I’ll continue to throw a dryer sheet in with the balls. I’ll definitely continue using the balls, too, though, since they cut the drying time pretty dramatically. I was also able to set the heat to medium, too,. That’s going to add up to a lot of energy (and money!) saved! The towels came out clean, smelled fresh, and I honestly couldn’t tell the difference between washing them with my old detergent versus the new Wonder Ball. Not having to buy laundry soap anymore is mighty appealing, let me tell you. So, I figured I’d test them again on something tougher – a load of my daughter’s dirty clothes. If you’ve ever washed a load of baby clothes, you know that all manner of eeeew gets on them. My girl is no exception, so I knew this load was going to reveal if the Wonder Ball would cut it at our house. I know that I was pretty skeptical when I started using the Complete Laundry System a couple weeks ago, so I took pictures to show you just what this cool little ball can do. Here is the protective mat from the changing table before and after I washed it (I’ll leave what those stains are to your imagination, just note that they’d been there a few days by the time this sucker made it to laundry day). After putting our towels and most of the clothes we wear week in and week out through several washings, I even noticed a couple stains started to loosen up and fade. I’ll admit that it’s still a little weird not to be pouring detergent into the dispenser. It’s so nice, though! This system is very kid (and in some cases, husband!) friendly – as long as the Wonder Ball stays in the washer and doesn’t take a ride in the dryer, you’re good to go. It’s easy, it saves money and conserves energy…and that makes mom happy! Want your own Complete Laundry System? Fern (who is just about the nicest lady you’ll ever encounter, she’s great!) has graciously decided to give away not only a Complete Laundry System, but also 10 one-year Wonder Balls for 10 runners-up!! How awesome is that?! This giveaway is open until Monday, May 25th at midnight EST. *Special note – if you followed on the old Screamin’ Deal blog, you’ll have to re-follow here (but just this once – once you’re a follower, you’re good to go at the new Makes Mom Happy site). Thanks!! **Second special note – entries without email addresses will be disqualified. I hate to do that, but I really don’t have time to chase down email addresses for everyone. So, please put your email address in at least one of your comments! This entry was posted in CLEANING, CLOTHING, HOUSEHOLD on May 18, 2009 by makesmomhappy.